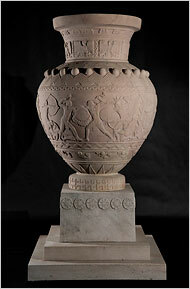 On Saturday, January 17th, in preparation for the Winter Antiques Show in New York, a vase, “Urn”, by American sculptor Paul Manship (best known for his work “Prometheus” that towers over Rockefeller Center’s skating rink), was moved into a city armory. The vase, made of pink Tennessee marble and measuring 9 feet in height, weighs a whopping 14,000 pounds (the equivalent of about 4 mid-sized cars) and was originally commissioned by William Mather, an Ohio industrialist, for display on his estate in 1914. The antique show, now a well-established tradition, has become New York’s pre-eminate show for antiques and fine art. It is also a fundraiser benefiting the East Side House Settlement, an organization serving one of New York’s poorest neighborhoods. The 56th Annual Winter Antiques Show is scheduled from January 22 – January 31, 2010.